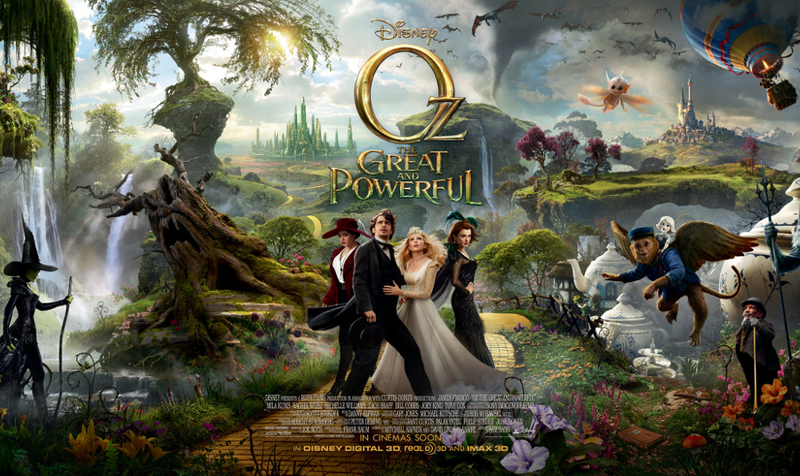 Oz the Great and Powerful is the latest live action movie from Walt Disney Pictures and director Sam Raimi. Based on L. Frank Baum’s novels, the film takes place before the events of The Wizard of Oz and stars James Franco as Oz, a magician from Kansas who, like Dorothy, is transported to the magical land of Oz. Once there, he discovers that a prophecy has foretold that a great wizard would fall from the sky and save the people of Oz from evil. With this being a prequel to The Wizard of Oz that was released over 70 years ago and the advances in technology since then, there was inevitably going to be a comparison of the latest high budget blockbuster to the classic film that people will feel nostalgic towards. Oz the Great and Powerful definitely has some similarities and references to the original 1939 film. Both start off in monochrome and progress into colour when the character reaches the land of Oz. The story then follows the adventure of our protagonist who will undergo a journey, meet new friends and develop as a character for the better. This movie does have a darker feel to it than The Wizard of Oz. The visuals can be compared to the latest Alice in Wonderland sequel, both of which feature a magical land created almost entirely in CGI (although Tim Burton’s was much darker). Oz the Great and Powerful is certainly a lot cheerier than the nightmare inducing Return to Oz (Dorothy gets put in a mental asylum then returns to Oz where the head-swapping queen has minions that have wheels for hands, yeah it’s trippy). The advances in technology have meant the look and style of the film has changed greatly, which is great for the environments that can be created but, at times, it does feel a little fake. The casting was what stopped this from being a great movie. James Franco delivers a typical ‘James Franco performance’ as Oz. Some question why he was cast as Oz since Franco doesn’t have too much scope as an actor, which is why I can’t say the cast wowed me in any way. That being said, there are the odd moments in the film he plays well. Mila Kunis plays one of the witches in the movie which was definitely a miscast. At the start she seems fine but her character’s transformation in the movie does seem really forced and out of character. The rest of the cast were okay, although no performance stood out in particular, except perhaps for Zach Braff who made a few jokes playing the comic relief: a flying monkey, a character I thought could turn the movie into something too cheesy. Like in The Wizard of Oz some of the characters from Oz’s life appear as someone else in the land of Oz. This was done quite well and is a great way of showing how Oz becomes a better person (even if he is still a fraud magician in the end). The references to the original are nice but the movie doesn’t play from them which is great to see. I don’t think Oz the Great and Powerful quite has that same magical feeling as the original but it’s in no way a bad film, it’s just another big budget Disney movie to satisfy an audience, make money and sell toys. I’m definitely glad that this hasn’t become a bad scar on the franchise. Oz the Great and Powerful is a non-offensive, fun family movie. It’s nothing incredible but kids will like it and fans of Disney won’t be disappointed. The movie is out now in cinemas worldwide. I’m disappointed to hear that it’s not as good as it sounded like it should be (and, from the trailer, looked). I will, however, still be going to see it, although it might not make its way into my DVD collection afterwards.